To be an artist, be it writer, painter, or actor, one has to have passion. If you do not love what you are doing, intensely, success will be a wisp of smoke never to be grasped. This is advice just about anyone could give. What they do not tell you is no matter what area of artistry you pursue, you need to know the business end of that profession. Writers need to know that writing is a business, painters the same, and actors need to know about show business. 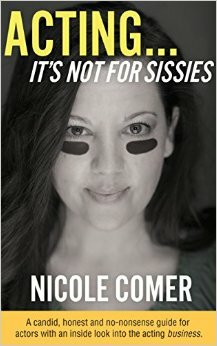 It is the business of acting that Nicole Comer addresses in this well written, humorous, and straight forward book. Her advice on dress, head shots, auditions, and agents is worth the price of the book. But what I found most interesting was the section on knowing yourself. To truly understand who you are, what you want, and how you are perceived is something all of us could benefit from, but few take the time to really discover. Anyone, in any profession, could benefit from the advice Comer gives, more so for anyone pursuing an acting career. As Polonius said in Hamlet, “This above all: to thine own self be true”. To do that one needs to know oneself. Comer provides the tools for anyone to do just that. This is a four star book with worthwhile advice. I held back one star as it is weighted heavily to acting in Los Angeles, although there is plenty for anyone thinking about acting anywhere. Thank you for the thoughtful review. Your sentiments are truly appreciated. Happy Week!